The image on the cover is only one of the many amazing photographs that illustrates the beauty of the natural world. 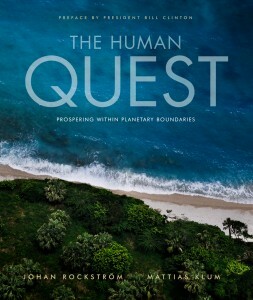 In The Human Quest: Prospering within Planetary Boundaries by scientist Johan Rockström and photographer Mattias Klum, we learn that Earth is entering a new age: the Anthropocene, an era in which humanity recognizes that it is a force capable of significantly changing the Earth. By acknowledging the global interconnectivity of humans and natural systems, the authors argue that humans must respect scientifically defined planetary boundaries in order to maintain environmental conditions in which humans can thrive. The book accomplishes this task with detailed anecdotes, sweeping generalizations, stunning photography, and artistic maps and graphs. To a certain extent, these elements are effective: the photographs are emotionally moving, the anecdotes compelling. However, it is difficult to determine the target audience, as different elements appeal to people with different levels of background knowledge. In addition, the author argues that we should change our practices to support a growing population. I question this — might we not accept that our population growth will be limited by our practices? Though this view is morally objectionable, it is more feasible than many of the sweeping changes it advocates. Overall, The Human Quest presents a compelling case for humans to better their environmental stewardship and lays out a framework for us to do so. However, the book is not without its flaws, as its stunning images do not quite compensate for the lack of a feasible plan. Hopefully it will appeal to our reason and our emotions enough to force us to craft such a plan ourselves.